Recent news reports suggest that the economic recession has hurt some groups more than others, particularly African Americans and Latinos. 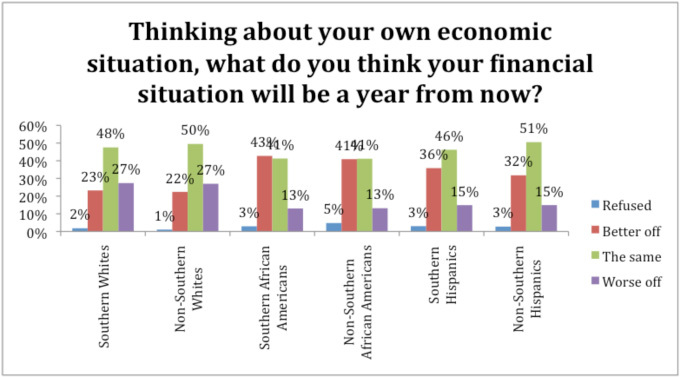 The findings from the Blair-Rockefeller Poll indicate that while unemployment rates are substantial among African Americans and Latinos, these groups still have surprisingly optimistic views of their economic future. Further, the survey reveals substantial regional variations – with African Americans from the South reporting comparably more positive expectations. While previous research suggests that high unemployment rates result in election backlash for the incumbent party, current economic conditions have not translated into negative views of the future among African Americans and Latinos. These findings challenge long-held assumptions about the impact of the economy on political attitudes and behaviors and may require scholars and political strategists to reconsider previous approaches during the upcoming presidential election. To the extent to which current economic troubles continue to be greater among various groups or regions across the country, presidential hopefuls may face an uneven terrain when seeking party support during the upcoming presidential election. Overall, Forty-nine percent of respondents indicated that they were employed working for someone else and 7 percent reported that they were self-employed, resulting in 56 percent of respondents reporting current employment of some form. 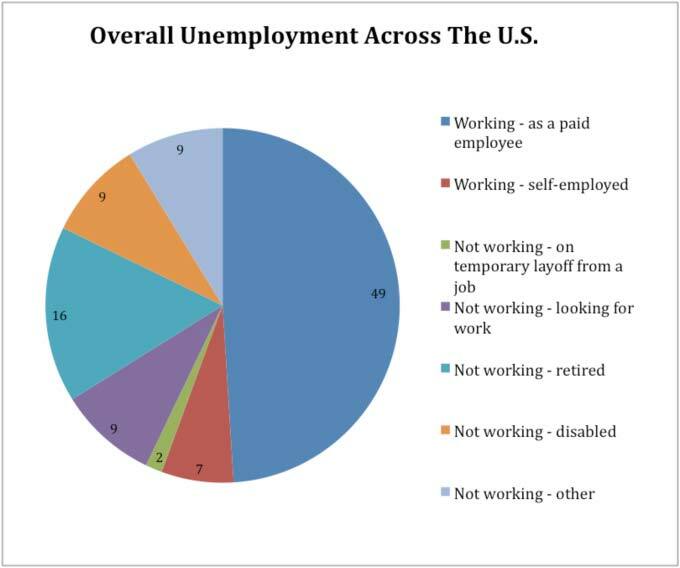 Comparatively, 16 percent indicated that they were retired, 9 percent indicated that they were looking for work, 2 percent indicated that they were temporarily laid off, and 9 percent indicated that they were not working because they were disabled. First, while 49% of the non-southern respondents indicated that they were working as a paid employee, only 44% of southern respondents indicated that they were working as a paid employee – a 5 percent difference in favor of the non-South. 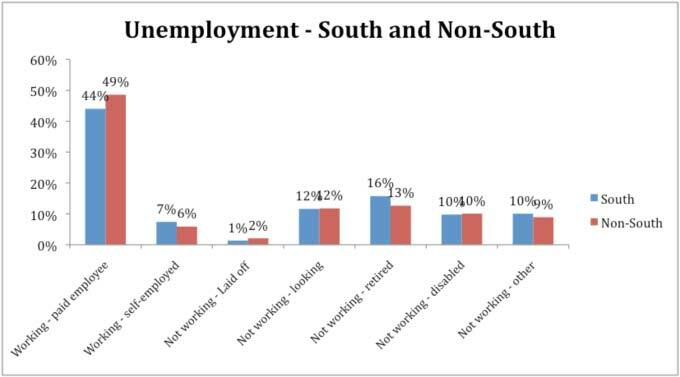 While percentages across most other categories were similar between the South and non-South, there were 3 percent more Southern respondents who indicated that they were not working because they were retired and 5 percent fewer southern respondents who indicated that they were working as a paid employee. While a five percent difference in employment rates between the South and non-South may not appear large, the aggregate results are that there are large numbers of southern respondents who are not in the workforce. Examining variations across both race and region, we again find very interesting variations. Looking first at those respondents reporting that they were working as a paid employee, we see that non-southern Caucasians reported the highest percentage of 54%, compared to just 43% of southern Caucasians. Comparatively, while 47% of southern African Americans reported being employed, that percentage fell to just 40% of non-Southern African Americans. There have been several recent reports in the media of African Americans returning to find work in the South. These data suggest that while the unemployment rate among southern African Americans is large, it is much less than the African American unemployment rate elsewhere. This pattern, however, did not generalize to Hispanics. As seen in the figure, 47% of non-southern Hispanics reported working as a paid employee, while only 40% of southern Hispanics reported working as a paid employee. Looking next at those who are not working but looking for employment, we see that the highest percentage of respondents is among non-southern African Americans at 21%. Comparatively, only 13% of southern African Americans reported that they were unemployed but looking for work. While the unemployment percentages are uneven across groups, another way to evaluate the overall effects of the economic downturn is to examine how an individual’s personal economic situation has changed during the past year and if they expected their economic situation to improve any during the coming year. 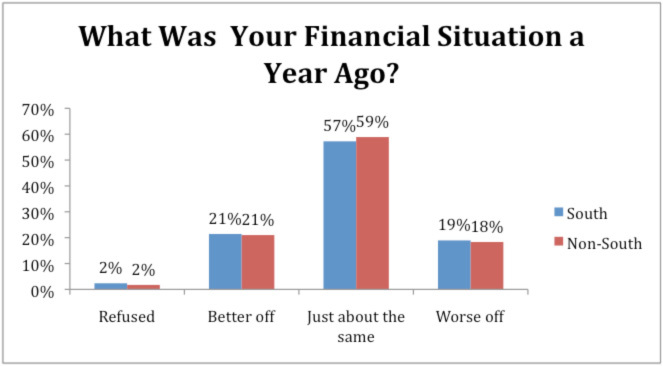 In this respect, the Blair-Rockefeller Poll asked respondents to report whether or not their financial situation had either stayed the same as last year (58%) or if that they were ‘better off’ a year ago (21%). 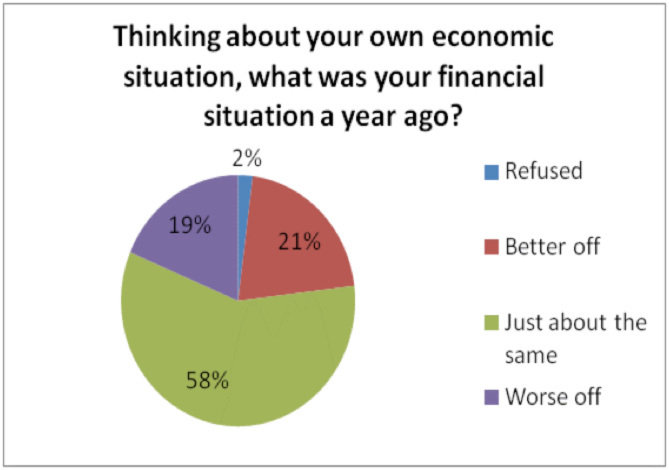 Only 19% of respondents reported that they were ‘worse off’ a year ago and now doing better. For many respondents the future isn’t very bright either. 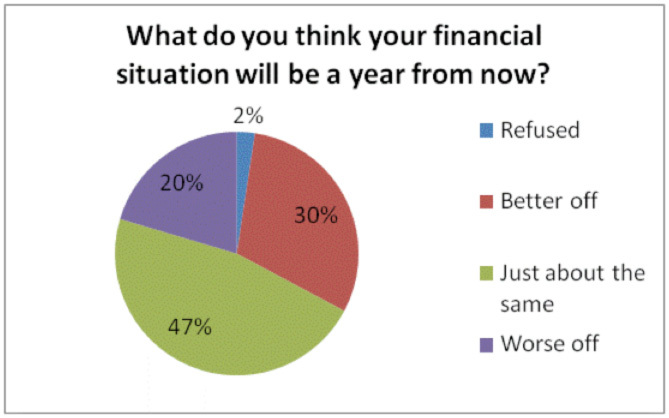 67% percent of respondents reported that they believe their financial situation will be ‘the same’ or ‘worse’ a year from now and only 30% thought they would be ‘better off’ in a year. 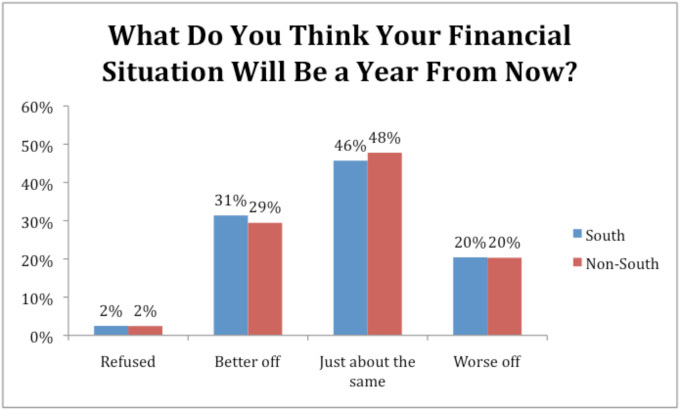 Clearly, the general public reported substantial pessimism about their financial situation and quite negative expectations for the future. Regardless, we proceed as before and also examine potential differences across race and region. As shown in the figures above, there are only minor differences in the retrospective and prospective evaluations of overall responses from the South and non-south. Given the variations in unemployment levels, it is possible that looking at the South versus the non-South is masking important differences across region and race. Consequently, the following figures show differences in retrospective and prospective evaluations across both race and region. As shown in the figures below, the majority of African Americans, Latinos and Caucasians, in the South and in the non-South, reported that they were ‘about the same’ as a year ago. Twenty five percent of Southern whites reported that they were ‘better off’ last year, compared to 17% of non-Southern Whites who reported that they were ‘better off’ last year. While Caucasians living in the non-South have certainly experienced the downturn in the economy, they have not apparently felt the sting as significantly as Caucasians living in the South. This ‘southern economic disadvantage,’ however, was not repeated among African Americans and Latinos. Among southern African Americans, 19% reported that they were “better off’ a year ago compared to 22% of non-southern African Americans. In other words, a slightly higher percentage of non-southern African Americans reported that they were doing better in the previous year than they are doing now. This non-southern economic advantage among African Americans, however, is somewhat offset by the percentages reporting that they were worse off last year. Among southern African Americans 20% indicated that they were worse off in the previous year compared to 18% of non-southern African Americans. Among southern Hispanics, 18% indicated that they were better off last year compared to 21% of non-southern Hispanics. Further, 62% of southern Hispanics indicated that their economic situation had “stayed the same” compared to 57% of non-southern Hispanics. Overall, a greater percentage of southern whites (25%) reported that they were “better off” in the previous year, compared to a smaller percentage of both southern African Americans (17%) and southern Latinos (19%) who reported being “better off” in the previous year. In terms of prospective economic forecasts, we again find important differences across race and region. While the largest percentage of Caucasians and Hispanics indicating that they expect to stay the same in the next year, a greater percentage of African Americans and Hispanics reported that they expected to be ‘better off’ next year. In fact, only 22% of southern Caucasians indicated that they expect to be better off next year and 23% of non-southern whites expect to be better off. Comparatively, the percentage of southern African Americans who expect to be better off is nearly double the percentage among Caucasians. Specifically, 43% of African Americans living in the South expect to be ‘better off’ next year, compared to 41% of non-Southern African Americans. Expectations of positive economic changes were also found among Latinos with 36% of Hispanics living in the South indicating that they expect to be ‘better off’ next year and 32% of non-Southern Hispanics expect to be doing better next year. Importantly, greater percentages of African Americans and Latinos reported that they expect to be doing better next year compared to the percentage of Caucasians who expect to be doing better in the next year. 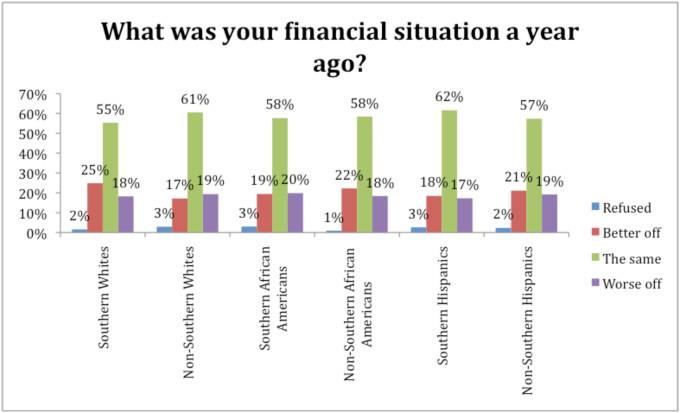 Further, a greater percentage of southern African Americans and southern Latinos indicate that they expect to be doing better next year compared to their non-southern counterparts. This difference is particularly substantial among Hispanics where 36% of southern Hispanics reported that they expect to be better off next year compared to 32% of non-southern Hispanics. To the extent that negative economic situations, as well as pessimistic negative expectations, result in backlash against the incumbent party, the GOP may find itself gaining even more support among Caucasians – both in the South and in the non-South. On the other hand, the Democratic Party may find greater support among African Americans and Latinos/Hispanics, particularly those who live in the South. While observers often lament the state of the national economy, the important differences in the economic impact of a sluggish economy are often overlooked. Continued attention to the economic situations and expectations across both race and region will provide a much better gauge of party strength in the next presidential election. Finally, while previous research suggests that the incumbent party suffers the most at the ballot box when the economy slows down, these patterns are based primarily on Caucasian voters. The extent to which negative retrospective evaluations will work similarly among African Americans and Latinos remains to be seen. As shown in the figures above, even though the percentages of respondents who were not working and looking for work were highest among African Americans and Latinos, these groups also expressed the most positive prospective evaluations. In other words, while African Americans and Latinos had the highest rates of unemployment, they also had the greatest percentages of respondents who were optimistic that they would be better off next year. While Caucasians had greater employment rates, they were among the least positive about their economic future. How these dynamics will play out over the next few months as we prepare for the next presidential election will be fascinating to watch. The extent to which previous findings about retrospective voting may or may not extend to minority groups and if southern minority groups continue to remain more optimistic about their economic future, we may continue to find increasing numbers of African Americans and Hispanics relocating to the South. The Blair-Rockefeller Poll is a national survey that was fielded immediately following the November 2010 midterm elections. The Blair-Rockefeller poll was administered by Knowledge Networks (www.knowledgenetworks.com), an internet based survey company that includes a representative sample of Americans in its proprietary data base including representation of the roughly 30 percent of U. S. households that do not have internet access. In addition, it covers the growing number of cell phone only households (recently estimated at 23 percent of all households) through address-based sampling. Pearl Ford Dowe, Ph. D.